Recent strides made in vehicular technology have resulted in a vast array of networked sensors assisting in vehicle operation, as well as raised consumer expectations of safety and comfort. In modern cars, thousands of sensor signals are continuously exchanged, and there is an emerging trend to retrieve this data in real time safety analysis. Transferring high bandwidth content is a challenge in such networks limited by (i) the transmission range, (ii) the bandwidth permissible in the higher frequency unlicensed ISM bands, (iii) short connection times, and (iv) the cost of cellular data plans. 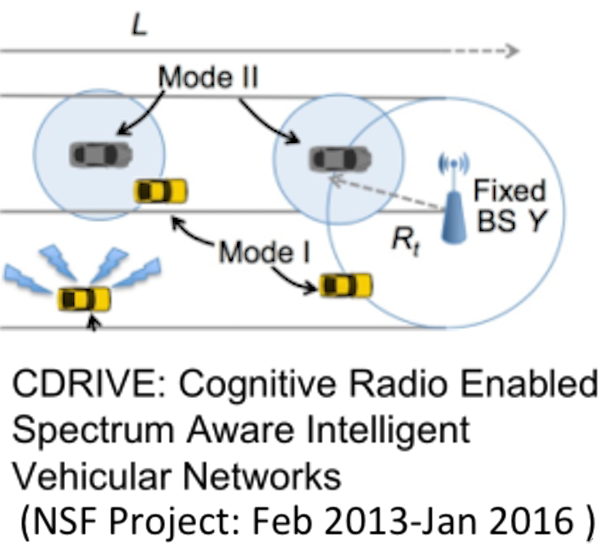 The project CDRIVE (for Cognitive raDio enabled spectRum-aware Intelligent Vehicular nEtworks) aims to develop a holistic spectrum sensing framework for vehicular CR networks. We will devise an analytical framework for determining the topology of a CR vehicular network for allocating roadside base station (BS) locations that have spectrum database access capability. We will explore the impact of early estimation of future spectrum needs, reservation costs, and different pricing structures that may likely result from this paradigm. We will advance the science of collecting spectrum measurements by a moving CR to determine the accuracy of spectrum sensing under different topographical conditions, urban structures and speeds, where direct spectrum database access becomes infeasible. We will devise a cooperative spectrum sensing-decision scheme that allows each CR to merge spectrum information from other neighboring vehicles. We will research how to ensure reliable data delivery is achieved in frequently disconnected networks, where both the position and the spectrum availability changes with time. A. Al-Ali, Y. Sun, M. DiFelice, J. Paavola and K. R. Chowdhury, “Accessing Spectrum Databases using Interference Alignment in Vehicular Cognitive Radio Networks,” IEEE Transactions on Vehicular Technology, vol. 64, no. 1, Jan 2015. Y. Sun and K. R. Chowdhury, “Enabling Emergency Communication through Cognitive Radio Vehicular Network,” IEEE Communications Magazine, vol. 52, no. 10, Oct. 2014. F. Mapar and K. R. Chowdhury, "Predictive Decision-Making for Vehicular Cognitive Radio Networks through Hidden Markov Models," in Proc. of IEEE ICC, Sydney, Australia, June 2014. A. Al-Ali, K. R. Chowdhury, M. DiFelice, and J. Paavola, "Querying Spectrum Databases and Improved Sensing for Vehicular Cognitive Radio Networks," in Proc. of IEEE ICC, Sydney, Australia, June 2014.